Petal cushions Tutorial. 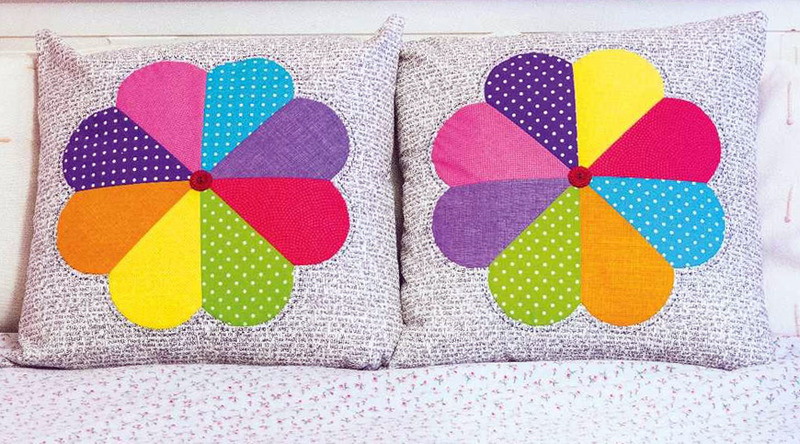 Patchwork ~ DIY Tutorial Ideas! All measurements include 1/4in seam allowances, unless otherwise stated. 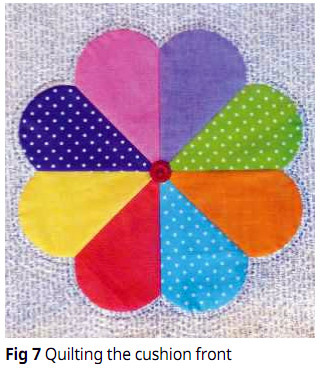 For the EZ Quilting template that Mandy used there are various petal sizes available on one template. The robust acrylic allows you to cut directly against the template without drawing around it first, thus speeding up the process and making it more accurate. The angle at the point is 45 degrees, so each flower has eight petals. For these cushions, cut around the outside edge of the whole template. This is the largest option, producing petals that finish 6 1/2in, and a whole flower 13in wide. 1. Use spray starch on the back of the fabrics, to stabilise the bias direction before cutting. Mandy used low-volume blender prints. You will need to cut eight petals, one from each fabric. You can stack the fabrics and cut through the layers. For accuracy it’s best to layer only four at a time. Centre the template with the straight grain of fabric; in this way each side will be symmetrical and cut on the bias (Fig 1). 1. Mark three points on each petal, at the centre point and at the start of the top curve on each side, 1/4in in from the edge (Fig 2). 2. Place two petals right sides together and pin through these marked points first. Stitch the pair together, starting and finishing each line of stitching at these marks and backstitching at the outer curve marks (Fig 3). Press to set the stitching and then press each seam in the same direction. Sew all the petals together into pairs in this way. 3. 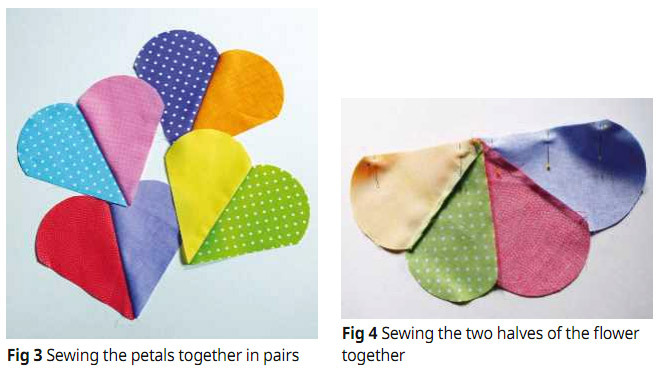 Sew two pairs together to make half of the flower (Fig 4). Repeat with the other two pairs. Now sew the two halves of the flower together and press the final seam. The centre seams should rotate around, distributing the bulk, as shown in Fig 5. 1. The flower is appliqued to the background fabric using the applique method of your choice. Mandy used needle-turn applique, and the following steps describe that method. 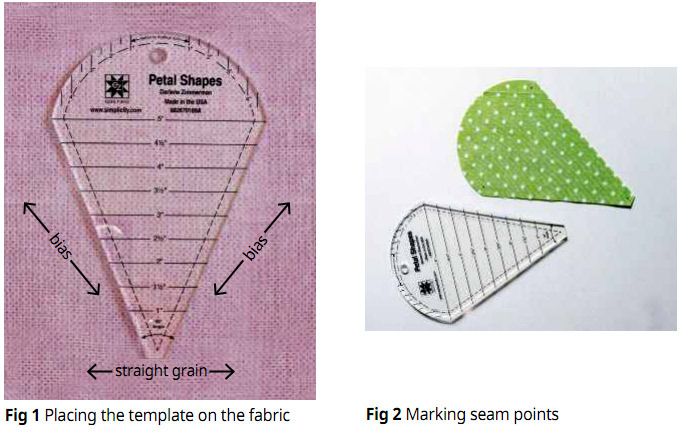 Begin by scoring a smooth curve with a needle to mark a 1/4in seam allowance around the curves of the petals (Fig 6). Press the seam allowance over and tack into place. If you find your seam allowance isn’t lying as flat as you would wish, clip partway into the curves before pressing the seam over. 2. Fold the 18 1/2in square of background fabric into quarters to find the centre point. Place the flower right side up on the background fabric, matching the centre points. Tack the flower in place and then applique using matching thread and small stitches. Sew the centre of flower to the background with a few stitches. 1. Mandy quilted her cushion with a mixture of hand and machine quilting. Layer up the cushion front, the wadding square and the lining square and press the layers together. Hand tack the layers together. 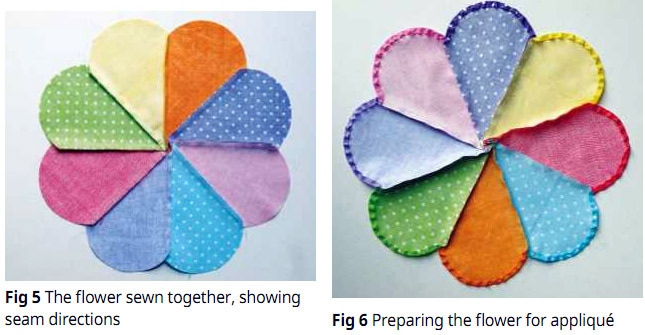 Place in a quilting hoop (if desired) and hand quilt 1/4in away from the flower, echoing the shape all round (Fig 7). Mandy used cotton perle thread in grey. 2. For the machine quilting, attach a walking foot and increase the stitch length slightly. Follow the shape of the hand quilting with machine echo quilting. When you reach the dips in the petals, stop with the needle down in the fabric, lift the presser foot and pivot. Quilt four rounds of machine quilting and then sew in all thread ends. 3. Pin around the edge of the completed cushion front through all layers, increase the stitch length to maximum and machine tack around the edge 1/8in in from the edge. Trim excess wadding and lining, so the quilted cushion front is 18 1/2in square. 1. From the fabric for the cushion back cut one piece 4 x 18 1/2in and one piece 16 x 18 1/2in. On the larger piece, press under 1/2in along the 16in edge. On the smaller piece, press under 3/4in along the 4in edge. 2. Take the zip, place it right side up horizontally and then place the turned-over edge of the large backing piece, right side up, over the bottom long side of the zip and pin. Using a zipper foot on your machine, top stitch in place, close to the zip. Take the smaller lining piece and place the folded edge along the top long side of the zip, so it overlaps the zip and covers the previous stitching. Pin and topstitch in place. Stitch across both ends of the zip, about 1 1/2in in from the sides of the cushion back, backstitching at the start and finish to secure. 3. Pin the cushion front and back right sides together. Unzip the back and leave it open so you can turn through later. Mark curved corners by using a 10p piece or similar circular object, and then stitch around the outside with a 1/2in seam, following the marked curves at the corners. Trim excess fabric, clip into the seam allowance a little at each corner and then turn through to the right side and press. 4. Remove tacking stitches. 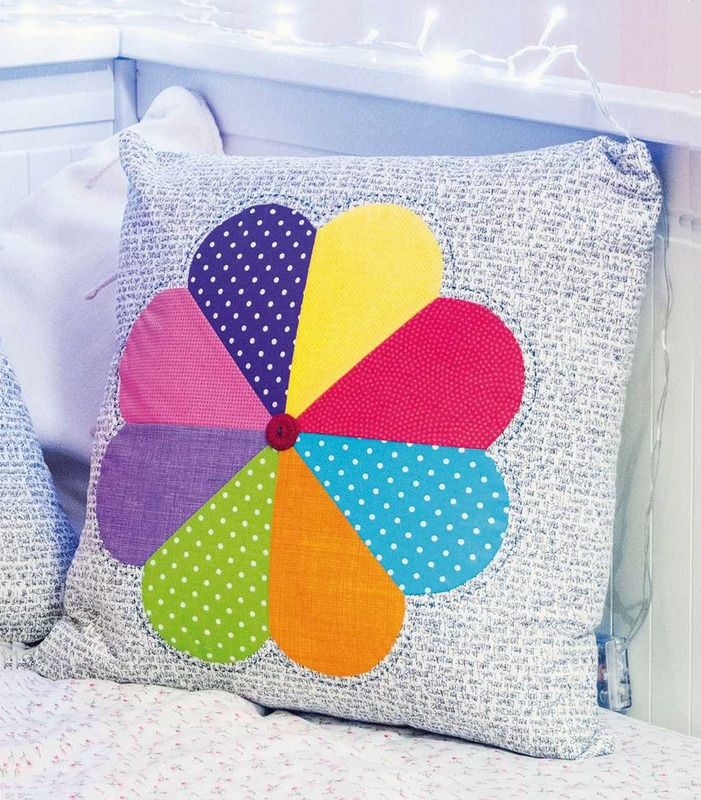 Sew a vintage flower button in the centre if desired (you might want to omit this if the cushion is for a very young child). Insert the cushion pad and close the zip to finish.